Here are seven of the best organic mascaras that will have your lashes looking great as well as keep them chemical-free. There are so many chemicals in everything these days and a lot of them are harmful to your health. Going organic isn’t just a hype new trend, it’s a way to get all of those harmful chemicals out of your life. I believe that it is especially important to get all of those harsh chemicals away from your eyes since eyes can be one of the most sensitive parts of the body. I also appreciate companies tat are cruelty free as well. Now there are amazing eye makeup products that are certified organic. I am especially fond of organic mascara because I sweat and if the mascara flakes I won’t have to worry about harsh chemicals falling into my eyes. 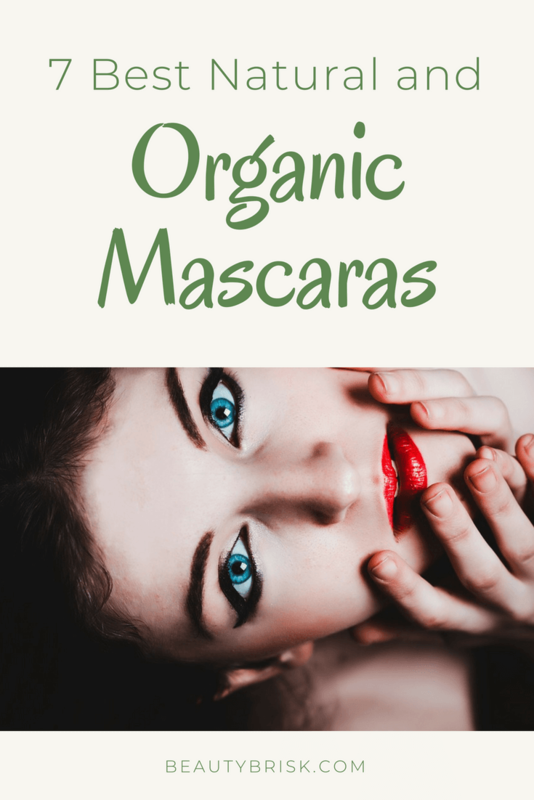 Here I have listed seven of the best organic mascaras that will have your lashes looking great as well as keep them chemical-free. This is an all natural mineral mascara that is hypoallergenic. This makes it perfect for people with sensitive eyes or watery eyes. It is Leaping Bunny certified, an international organization that recognizes cosmetic companies who don’t test on animals. The mascara is clump free and layers well. This isn’t the best mascara for volumizing, but it will give you gorgeous lashes. I would use this as an everyday mascara and use a different one when I need a glamorous look. The downside to this mascara is that it is pricey and the brush tends to get caked. Here is a mascara that will lengthen and condition your lashes. It has two ingredients that are known for their positive effects on hair–chamomile snd sunflower oil. This all natural formula is organic and healthy. The mascara is a deep black and gives you nice volumous lashes that could be good for daily wear. It isn’t waterproof but it is water resistant so you will want to use a good makeup remover in order to prevent lash loss. This mascara does smudge and flake a little so if you are a person who sweats a lot or if you rub your eyes a lot you want to opt for something different because you may end up with racoon eyes by the end of the day. 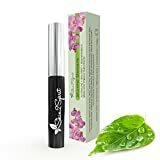 This mascara has some of the best organic ingredients such as chamomile, rosemary, thyme, oregano, grapefruit, vitamin E, and more. It is scented with a coffee and vanilla-like scent. I am not a huge fan of scented mascaras, but if you like them this is a good one. Not only is it not tested on animals, but it is vegan, gluten-free, and all natural. Although it isn’t waterproof, it is water resistant and sweat resistant. It also comes off fairly easily with hot water or a good makeup remover. Despite the smell, it isn’t irritating to the eyes. It does come in a smaller tube than other mascaras, and it cost more than the average mascara, so this translate to it being an expensive mascara. This is an amazing 3-step waterproof mascara. If you want to look like you are wearing false lashes without actually wearing false lashes, you should consider this mascara. It gives you incredible volume and length. This product isn’t really just a mascara. Its more like a system. It comes with the gel mascara and the fiber mascara separated (many waterptoof mascaras have the gel and fiber mixed). The third tube is the nourishing base that moisturizes your lashes as you wear the mascara. The disadvantage is that the fiber mascara tends to flake a lot (like most fiber mascaras). To combat this, you can add an extra layer of the gel after the layer of fiber. Doing so may cause another problem–loss of lashes due to the weight of all the layers. If you use less of each layer, the weight won’t be so heavy. Also, make sure you use a good makeup remover that can dissolve the formula rather than having to scrub it off. If you are looking for a simple volumizing mascara with great results, this one is a great choice. It is certified organic by Ecocert, a French certification company that has become on of the largest in the world. 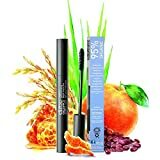 Made with acai berry extract, organic beeswax, jojoba oil, sunflower oil, marula oil and more, this mascara doesn’t just look good but it also protects your lashes, moisturizing them as you wear the mascara. The mascara has a great spiral brush that is tapered on one end so it can easily get to the lashes in the corner of your eyes. The mascara wand is great, but one problem is that it can get pretty caked after a while. Also the formula can dry up a little faster than others. Overall, this is a really good mascara and if you use it often, you will probably run out before it dries up. 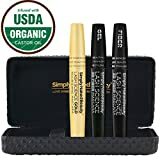 This mascara is made in the United States and is certified organic by the USDA. It has a scent to it–according to the manufacturers it has a chocolate scent although it has been described by some as more of a minty coffee scent. For me personally, I don’t want my eyes smelling like chocolate or coffee, but if you are okay with it then you would like it. 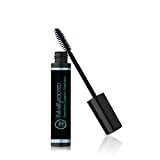 This is a pretty decent mascara that has a rich black color derived from organic coffee beans extract. In fact, a lot of the ingredients are a little unusual such as rice extract, and carbauba wax which comes from Brazilian palm trees. One ingredient that is found in the mascara in trace amounts is shellac. This is an insect secretion that has been known to cause irritation so if you have sensitive eyes it may not be suitable for you. According to the manufacturer, they aren’t purposely using shellac. These trace amounts are from the leaves of the Brazilian palm trees that they use. The amount is probably small enough to ignore. If you want a fun, blacker-than-black mascara, then this is a great choice. This cruelty-free mascara has great staying power. It is smudge resistant, doesn’t flake, and won’t give you raccoon eyes. You would think that its waterproof until you see it easily come off with a little bit of facial cleanser. It even has amazing packaging. It features a great 1950’s film noir-like image on it. 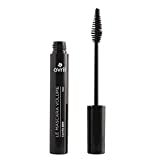 On the inside the mascara has a curved wand with evenly spaced bristles. This allows the wand to fit snuggly to your lashes and will prevent clumps. The wax prevents smudging and it is great at giving volume, even to thin lashes! In my opinion, the best mascara out of this list of seven is theBalm Mad Lash Mascara. I love using mascara with a rich, deep black. Also my lashes are thin, so this is one that improves them dramatically. Also, the graphics make using the mascara fun. I wanted to pick the Simply Naked Beauty 3D Mascara, but as a contact lens wearer, the idea of all that flaking is a nightmare. Overall, they each have pretty good qualities, but my choice is theBalm Mad Lash mascara. I choose organic over regular mascara because its safer than putting all those harsh chemicals on my face, especially on my eyes. I also appreciate companies who don’t subject animals to inhumane testing. TheBalm Mad Lash Mascara is a company that fulfills both of those desires. I hope you will enjoy it also! Happy shopping!